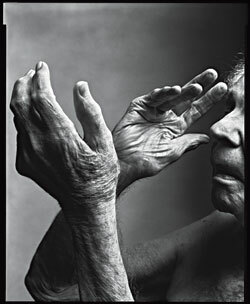 Cunningham—who, like Graham, found his greatest fame as a choreographer—turns 90 this week. His face has relaxed into folds, his hair now sits in tufts of gray on his great balding head, and his voice has softened considerably. But he continues to teach class twice a week, and his counts remain insistent and direct. On Thursday, Nearly Ninety—a new evening-length work and his longest in a while—opens at BAM, with a score composed by Sonic Youth, John Paul Jones of Led Zeppelin, and mixed-media sound artist Takehisa Kosugi. The artists will be approximating, as much as possible, the philosophy of Cunningham’s creative and life partner, composer John Cage, who died in 1992. And as with every performance since Cunningham teamed with Cage, he and his dancers will first hear the music at dress rehearsal. BAM. April 16 through 19.